I am delighted to announce a new recruitment and to welcome a fresh team member of AcrossBorders: Lucia Sedlakova, BA student of LMU Munich, has worked in the field on Sai the last two seasons. 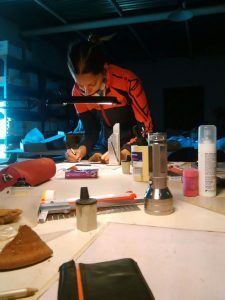 She is now joining the team working on pottery and small finds, focusing in particular on the digitalisation of the original drawings and preparation of plates for the final publication. Lucia has great drawing skills and her beautiful illustrations of various types of small finds from Sai are of high quality. A very warm welcome and thanks for strengthening AcrossBorders in its final year! P.S. : I am proud and happy to stress that Lucia’s position in the team was enabled by the successful application of a former team member – Vanessa Becker received a PhD position in my hometown Vienna and is therefore leaving Munich – all the very best and good luck, well deserved!